LAS VEGAS – August 30, 2018 – The ultimate power and style of American muscle cars is preparing to take the stage when Barrett-Jackson rolls into the Mandalay Bay Resort and Casino for its 11th Annual Las Vegas Auction, Sept. 27-29, 2018. The premier automotive lifestyle event will auction a wide range of classic and late-model muscle, including a ’68 rotisserie-restored Shelby GT350 custom fastback (Lot #698) and the world’s fastest quarter-mile production car, a 2018 Dodge Challenger SRT Demon (Lot #768), which is one of 17 built with its specific options. One of the anticipated MOPARs crossing the block in Las Vegas is a ’68 Dodge Charger R/T (Lot #688) that’s powered by a massive 426ci HEMI engine. Reminiscent of the villain car in the movie “Bullitt,” the ominous black big block has a 4-speed manual transmission and only 500 miles since its meticulous restoration. It will battle for attention with a heroic ’68 Ford Mustang Bullitt re-creation (Lot #668) that comes with Steve McQueen’s signature and a certificate of authenticity. Lot #720 is a ’66 Dodge HEMI Charger from the John Staluppi Jr. Collection, an incredible survivor vehicle that’s been meticulously maintained and kept mostly original for nearly 50 years. Also from the John Staluppi Jr. Collection is a ’70 Chevrolet Chevelle LS5 (Lot #716) that features matching numbers and is date-code-correct. It is one of two Mint Green SS 454 cars, and only one of 2,763 with the LS5 engine, M22 Rock Crusher 4-speed manual transmission and standard SS hood. For Ford performance enthusiasts, Barrett-Jackson will be a Candyland that includes a ’70 Torino Cobra 429 J-Code (Lot #647.1). One of 1,357, this Calypso Vermillion J-Code had a highly detailed build, down to every bracket, nut and bolt, which is either reconditioned or new. Late-model Mustangs include a ’08 Roush Trak Pak Coupe (Lot #388) that is #40 of 100 built and has only 15,000 actual miles. 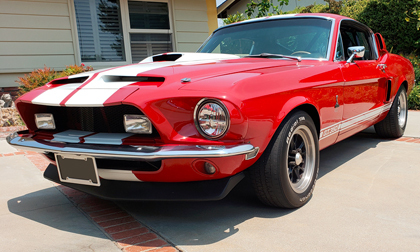 With only 2,825 original miles, a ’07 Shelby GT500 Super Snake (Lot #447) is powered by 725hp engine mated to a 6-speed manual transmission with short-throw shifter. It was built at the Shelby American factory in Las Vegas and was documented in the official Shelby Registry as CSM #07SS0066.